Now that it's cool to care about the Boston Marathon again, Fittish would like to familiarize you with the runners at the front of the pack. This morning's elite: Desiree Linden. Explain? She done got hitched. Incorrect Name: "DaSilva" by mom-caller Al Trautwig in the 2011 Boston Marathon, which she almost won. Almost? It was pretty damn close. Not More Asterisks: Yep. Linden's PR came in the Boston Marathon in 2011, the same race that Ryan Hall's Breath of God pushed him to a 2:04. For a host of reasons, the course is ineligible for records. So, She's The Female Ryan Hall? God, no. Unlike Hall, who acted as the sacrificial lamb for the leaders in the first half (most of whom would then leave him behind when the real racing started), Linden ran a not-stupid 20 miles, slugged it out with the leaders over the last 10K, and finished second, a scant four seconds behind the winner. That's what not racing like a dummy will get you. 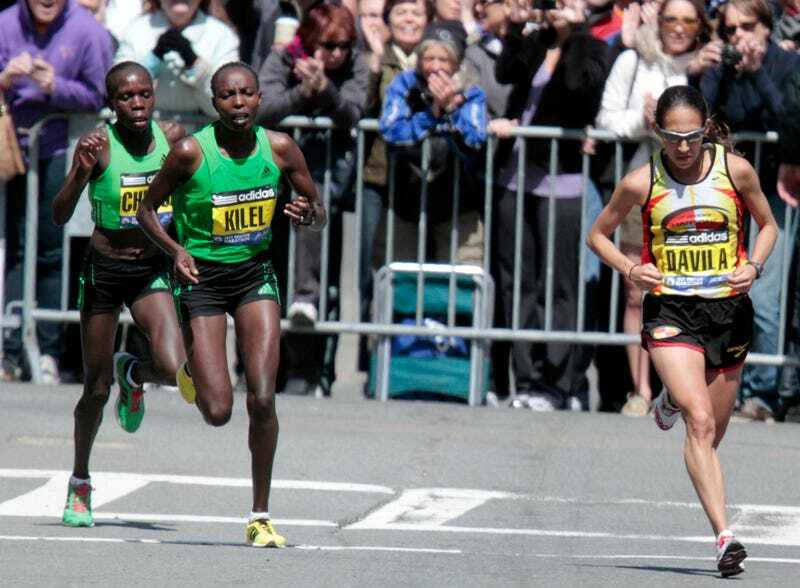 Upside: Boston '11 wasn't just a one-off; she backed it up at the 2012 Olympic team trials marathon when she finished runner-up. Downside: At the trials she earned an Olympic spot, but then had to drop out shortly after the start of London Olympics with an injury, missing the opportunity to run in the only sunny weather in the country's history. Why Can't I Stop Looking At This? The fingers? Likelihood Of Victory: An intimacy with the course, six weeks training in Kenya this winter, and perfect weather conditions on Monday make it not unthinkable. But the Sox have transferred the Curse of the Bambino to the Boston Marathon, and no American woman has won the race since Lisa Larsen-Weidenbach in 1985. People Probably Don't Beat That To Death: Only here, here, and here. It's kind of a tradition. Predicted Finish: Top three. How's that for pointing the bat. Fun Fact: Linden saw Bob Seger in concert three times in one year. Even she can't explain that.